Forgiveness can only occur when the offended person volunteers to assume the debt and not to get even or seek revenge. 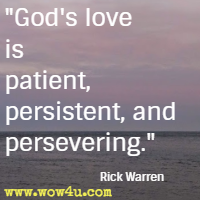 God's love is patient, persistent, and persevering. How many people does it take to argue? It takes two, right? If one of them walks away, what happens to the argument? It ends. The fire goes out. The amazing thing about the school of experience is this: One, if you fail the test, it’s OK. You get to take it over - and over and over and over until you pass it. Second, just about the time you think you've graduated, they add another course. You will be in that school the rest of your life. When discouragement comes, you can rest assured in one thing: God chose you to be a part of his family. Long before you chose God, he picked you! God has made an enormous investment in you. First, he created you. Second, he shaped you with spiritual gifts and personality. Then he sent Jesus to die for you. God has made an incredible investment in your life! There are no perfect people who can say to the world, "I don't need anybody else." We need each other. We were made to work in teams! A lot of people think the whole purpose of life is just to collect stuff. You’ve seen the bumper sticker: "He who dies with the most toys, wins." The truth is, "He who dies with the most toys ... still dies!" 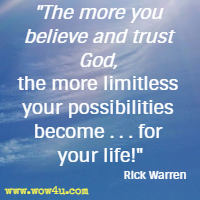 The more you believe and trust God, the more limitless your possibilities become for your family, your career - for your life! Then, here's the question I ask myself sometimes: Why do we spend more time listening, watching, and reading something we don't believe than something we do? God wants us to use this time on Earth to learn from his wisdom so that we can make wise decisions. When we make poor decisions, God extends his grace to us through Jesus Christ. God loves diversity. He doesn't want everything exactly alike. God gets bored with sameness, and that's one reason there's nobody else in the entire world like you. We can depend on what other people think to determine our values. The problem is, the world often values the wrong things. For instance, the world emphasizes beauty over character, or tells us to pursue whatever feels good, or declares that whoever has the most possessions wins. 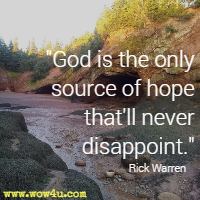 God is the only source of hope that'll never disappoint. When we place our faith in him, he provides joy, peace, and hope that overflows. God is actively working to bring good out of whatever happens in your life. To hold on to hope in the midst of tough times, you'll need to grab a hold of this truth. Because God created you and Christ has made you acceptable, don't worry about what other people say about you. God is with you and he is for you. God will never leave you. I can't tell you a better thing to help you raise your confidence level than to get in the Bible and start believing what God says about you. 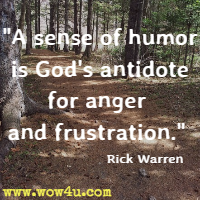 A sense of humor is God's antidote for anger and frustration. humor The fear of rejection prevents connection, and the only way to get rid of fear is to do the thing you fear the most. Learn communication skills, replace bad relationships, reach out, and risk connecting with someone. Your circumstances and consciousness have shaped who you are, but the way you respond to your circumstances and the thoughts you choose to believe will shape the rest of your life. The situations that will stretch your faith most will be those times when life falls apart and God is nowhere to be found. This happened to Job. Mercy is not just a feeling. It is love in action. Peacekeepers avoid conflict and pretend it doesn't exist. But peacemakers resolve conflict and reconcile relationships. Mercy will cost you, too. It’ll cost you time, money, or potentially relationships. Mercy that doesn’t cost much isn’t worth much. But God promises that when you help hurting people by giving what you have, he will bless you in return. Being in a hurry is always the death of kindness. The busier you get, the less loving you will be. God's love never wears out. 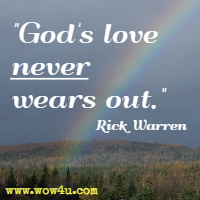 More Rick Warren Quotes: . . .